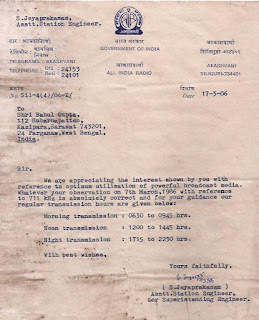 I have been DXing since I was a kid but due to some family reasons and work pressure I had to give up my passion for DXing and I was inactive from 1987 to 2008. 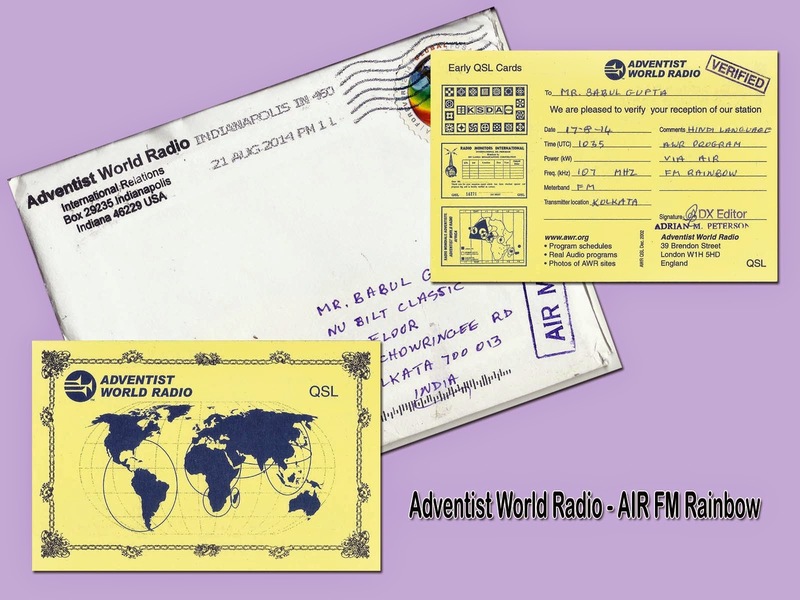 I got back and regained all that I had for Radio and DXing but in the meantime a lot of my verification letters and QSLs got displaced. 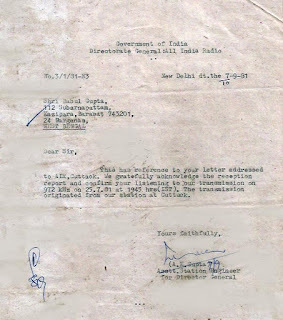 I have managed to get back a lot of them so I would like to share them with you. 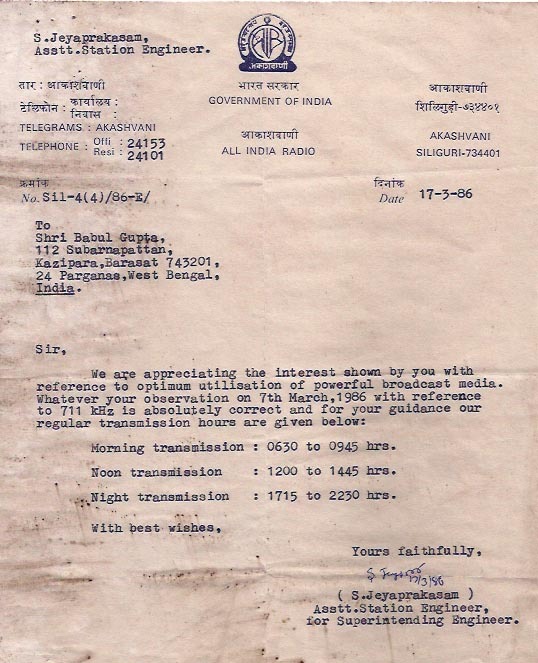 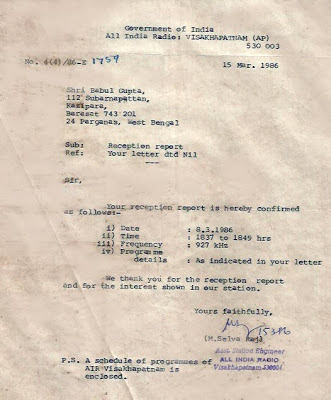 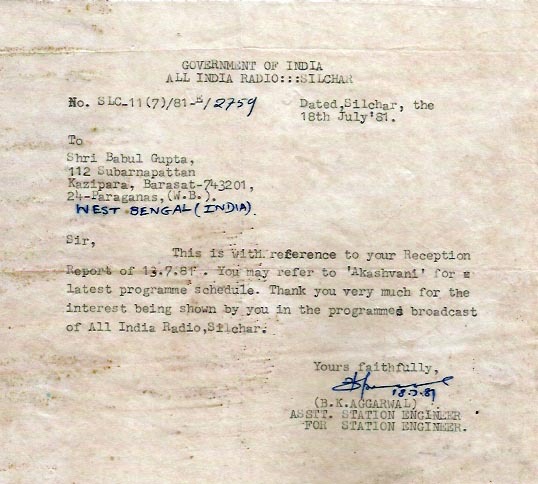 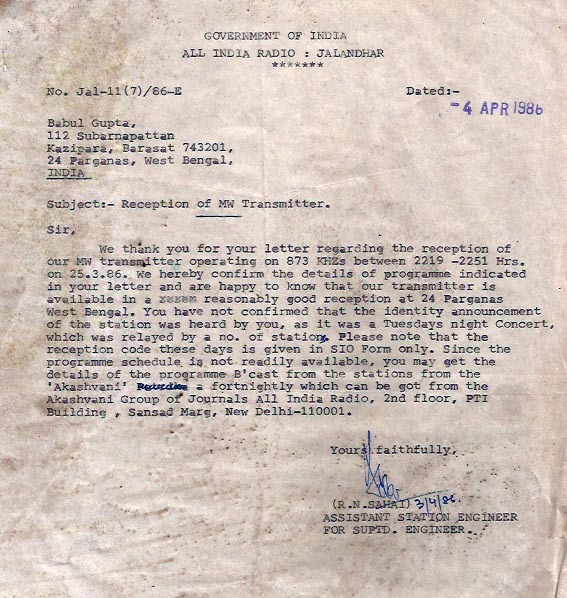 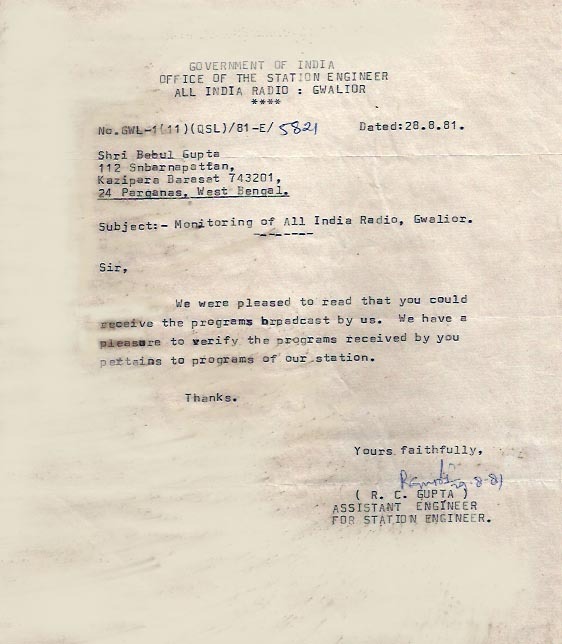 All India Radio - Silchar: 828 kHz medium wave, 1318 hrs to 1350 hrs GMT log this station on 13th July, 1981. 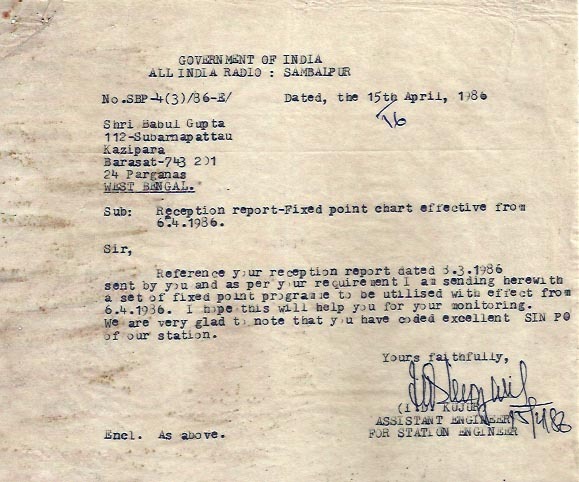 All India Radio - Visakhapatnam: 927 kHz medium wave, 1837 hrs to 1849 hrs IST log this station on 8th March, 1986. 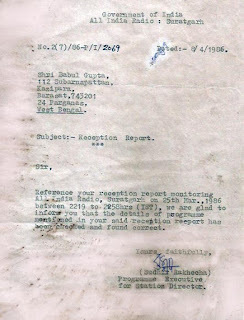 Sambalpur - 768001, Odisha, India. 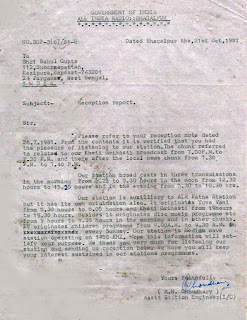 14th June, 1981. v/s M.S. 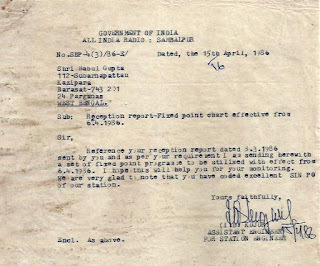 Karmaikar. 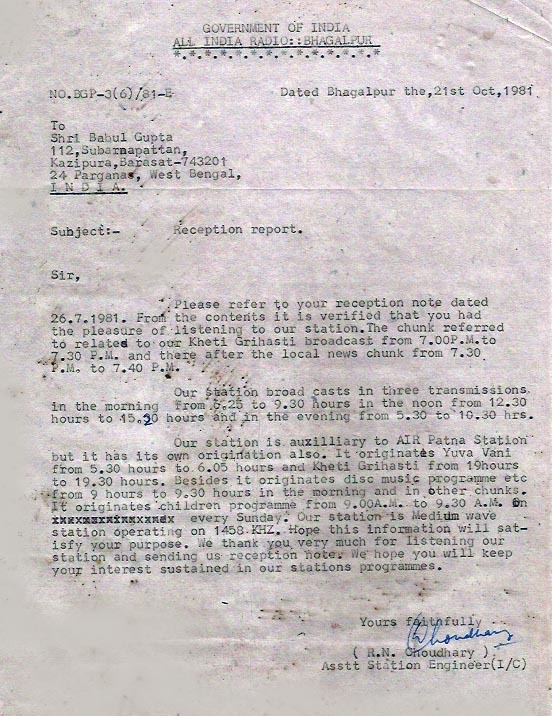 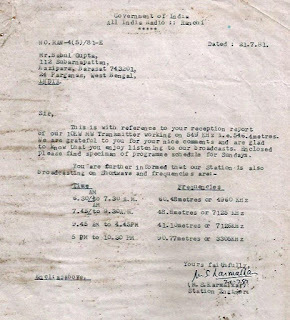 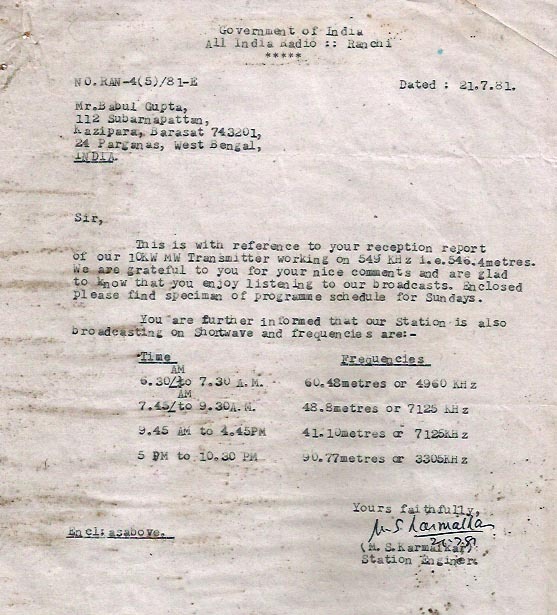 1920 hrs to 1945 hrs IST log this station on 26th July, 1981. 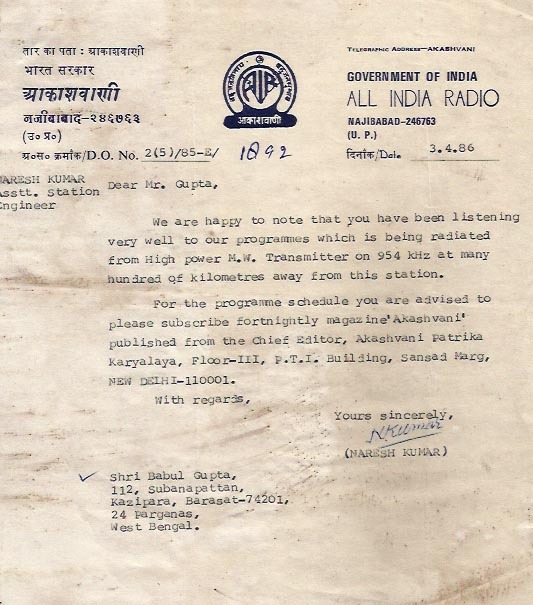 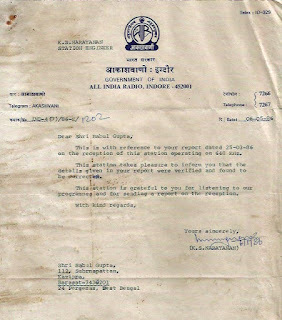 All India Radio - Gorakhpur: 909 kHz medium wave, 2030 hrs IST log this station on 13th July, 1981. 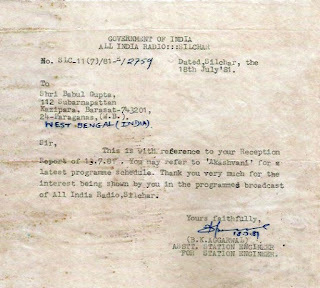 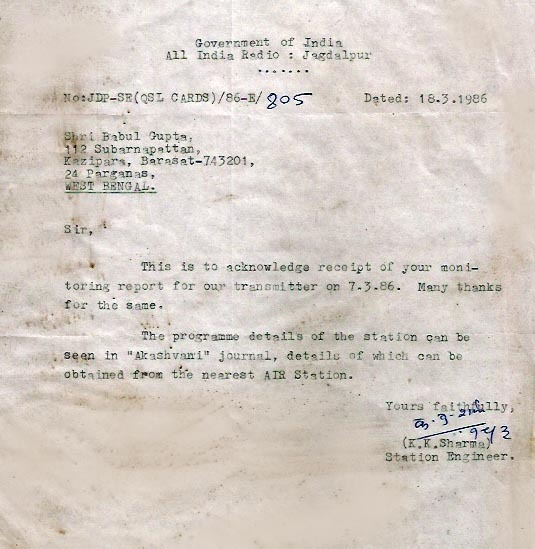 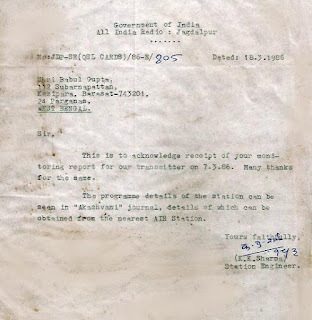 All India Radio - Jeypore: 1467 kHz medium wave, 2030 hrs IST log this station on 26th July, 1981. 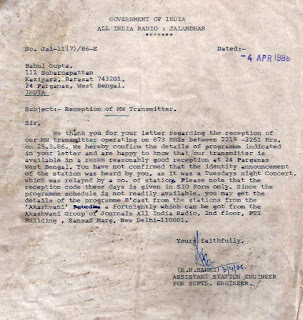 Darjeeling Dist., West Bengal, India. 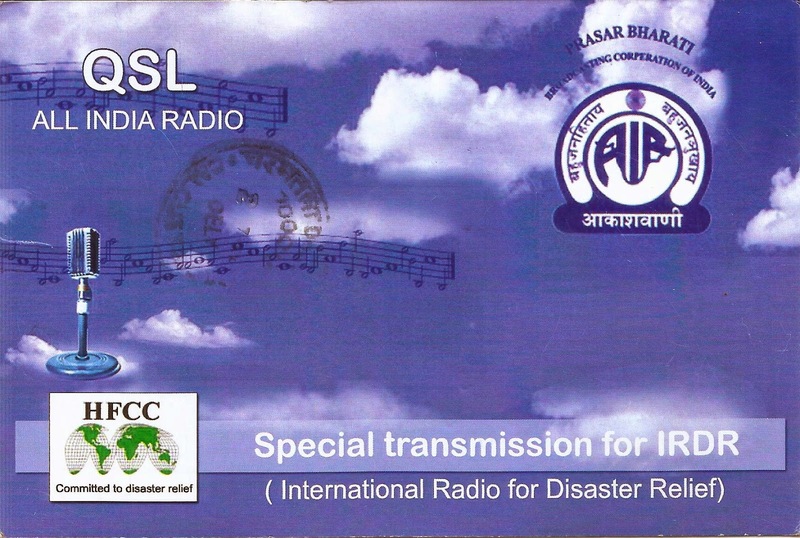 All India Radio - Chinsura: 1134 kHz, test transmission at 2000 to 2030 hrs IST, log this station on 17th June, 2013 and eQSL letter arrived on 5th July, 2013. 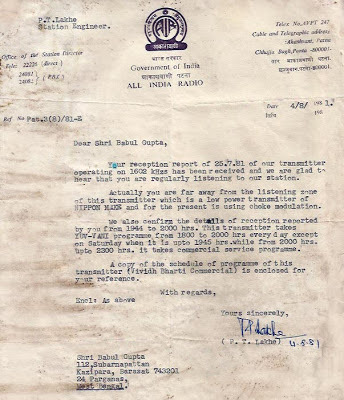 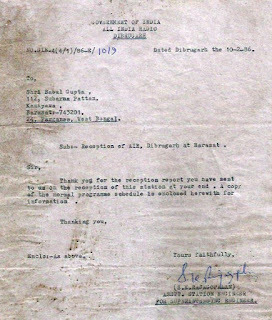 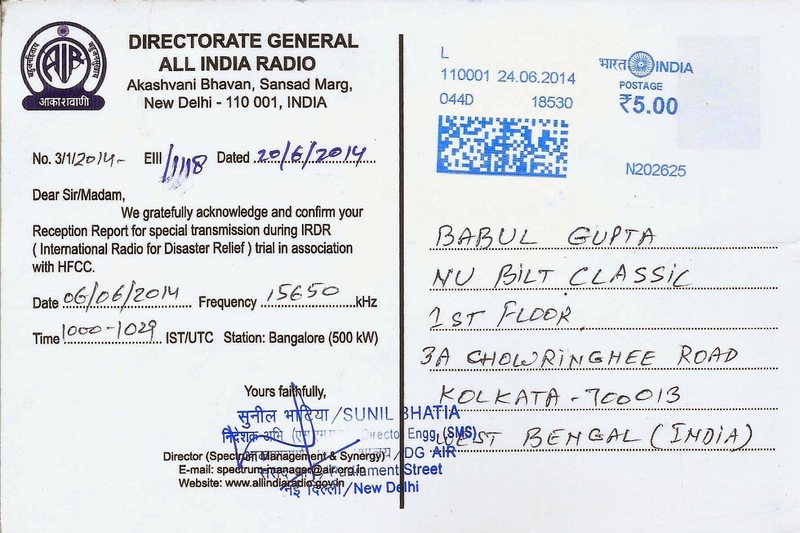 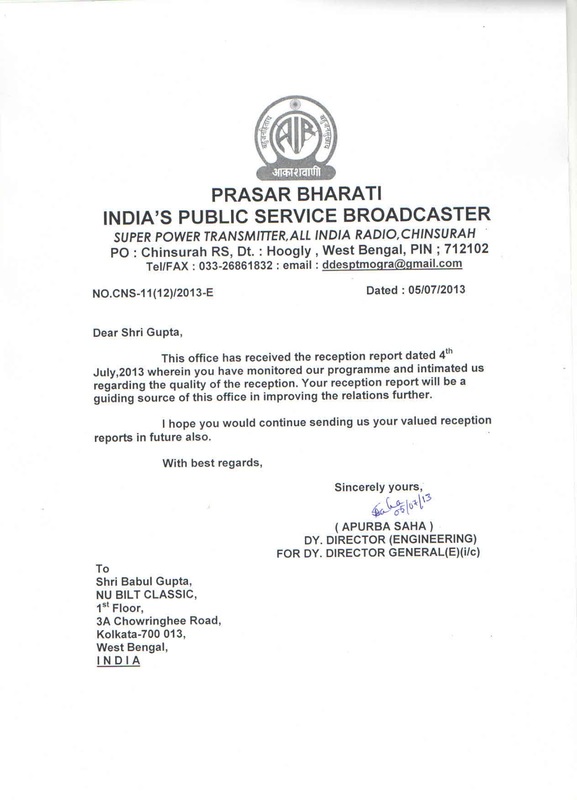 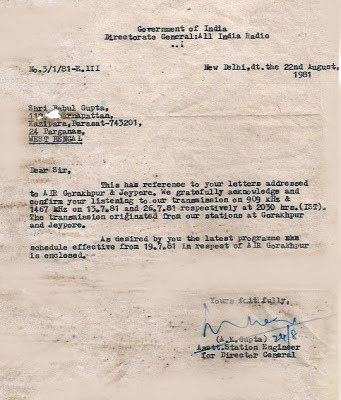 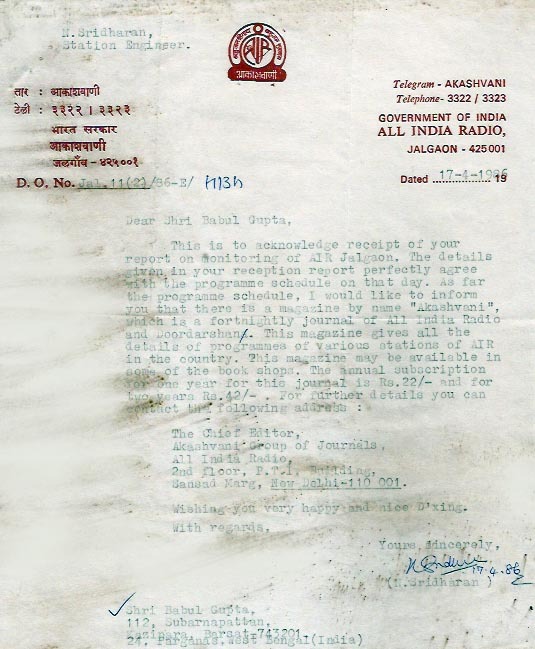 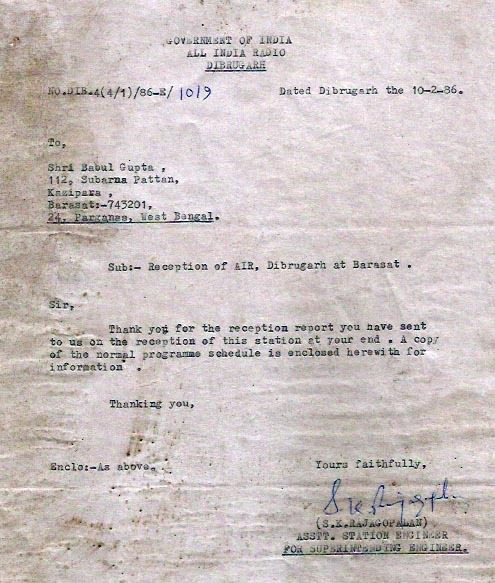 All India Radio - Chinsura: 594 kHz, test transmission at 2100 to 2130 hrs IST, log this station on 4th July, 2013 and eQSL letter arrived on 5th July, 2013. New Delhi - 110 001, India. 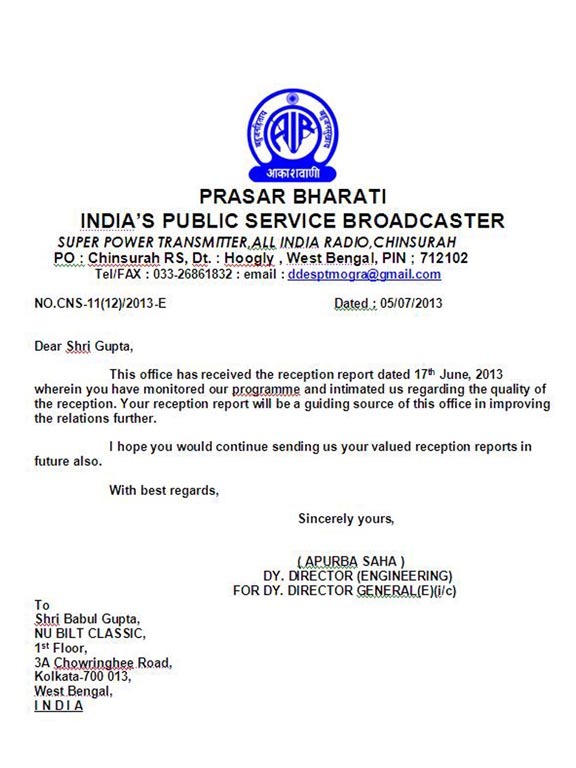 Really i surprised to see this what a information inside it.